It has been raining all night. And when it rains, I feel lazy and all I want to do is curl up with a warm fuzzy blanket, on my sofa. My faithful Pinky laptop is with me and a nice cup of steaming hot coffee by her side. I switch on Pinky and click on my Games folder. By this time my curious cat Phoebe has made her way to my coffee table. She positions herself right behind my laptop and purrs as I immerse myself in my PC games. 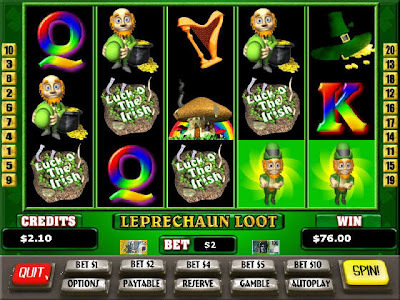 My favourites are slots from Reel Deal. The graphics are always so cool and the games interesting. I am waiting for the latest one to come out and it's been ages. Meanwhile, the many unfinished slot games already installed in my laptop keep me company this cold rainy night. They don't call me a Slot Machine Fan for nothing and as the rain falls harder, the faster my fingers click on my play button. I continue playing my trusty slot machine games on Pinky whilst the rain relentlessly falls. Playing my slot games as I listen to the pitter-patter of the rain outside makes for soothing therapy. 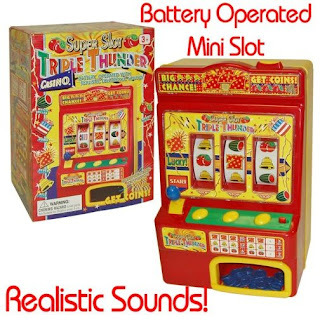 But as much as I love playing slots on a chilly rainy night, I think I would love playing slots on this mini slot machine even more! I just saw it online and now I can't stop thinking about this adorable slot toy. Doesn't it look like the Reel Deal? Ka-ching! Hehehe damn early chop today! Thanks GG! I am doing just fine GG, enjoying coffee now. You? Yes u did GG, u are top chopper so far this month, meow meow! He he not sure la GG! Thanks for the RT sweetie! Have a good day at school GG! Thank you for chopping meows, have a good day! 12 hours sleep def fresh today Mon! I think I wanna sleep early again and then wake up in the wee hours of the morning he he! Kuching semua apa khabar? sihat? Blackie kirim kata "Olla"
Oho, i think i want that battery operated. Sesuai bila dalam keadaan tertekan boleh putar-putar hiburkan hati. hi marzie...i ahven't been here in ages! :* :* :* :* Elai!